While some hunters spend hundreds or even thousands of dollars on deer hunting clothes, others prefer to be more practical. Although high end apparel may provide more versatility, a $50 camo will do its job as well. It’s all a matter of looking at the right place, knowing what to look for, and trying out what works for you. Read on if you’re up for some practical tricks to choosing deer hunting clothes. How Does One Choose Deer Hunting Clothes? This article was originally posted on OutdoorWarrior.com and is posted here with full permission. Deer hunting clothes can make or break the outcome of your hunt. When you’re out in the field wearing a very uncomfortable set of clothes, it may prevent you from concentrating on the hunt itself. Furthermore, apparel that make too much noise will spook deer out making you leave empty handed. This may be a lot to consider but you’ll have to be practical as well, especially for beginners. You don’t want to invest so much on things you’re not even sure about in the first place. Here are some practical tips on choosing your deer hunting clothes. The primary function of your clothes is to protect your body from the elements. As such, you should wear clothes appropriately with respect to the weather. Of course, you don’t wanna wear something too thin on a chilly winter day ’cause you’d freeze to death. Conversely, you’d wanna wear something light in the warmer seasons. Furthermore, the environment’s natural color scheme change with the seasons so wearing a camo that’d blend in with nature is the best option. A good way to stay dry and warm is to waterproof your clothes. Sometimes, a waterproof jacket will suffice. However, you’ll need to have a water resistant pair of pants and boots as well if you’re hunting in a wet environment. Wearing GoreTex fabric is great for waterproofing your clothes. The only consequence you’ll have to face is how pricey it gets and it easily tears. Cotton and jeans are comfortable when you’re in the city but it’s not the type of clothes you wanna wear on the field. For one, clothes made from these materials take a long time to dry. In addition, they’re heavier than your usual outdoor clothing. Furthermore, deer can see the color blue as clear as the sky. Be sure to wear stretchable polyester clothes for comfort and, they don’t easily tear if they get caught up in something. If you’re hunting in cold conditions, be sure to wear enough layer of clothes on. When hunting below zero, I always make it a point to wear at least three layers of clothing. For the base layer, I have a compression shirt and a sweater on top of that. The last layer is the waterproof jacket I got from Cabela’s for around $80. No matter how many sets of clothes you have, you should always have blaze orange set for rifle season. The blaze orange plays a detrimental role in reducing rifle-related accidents. Plus, deer aren’t very adept at seeing color so it won’t present a problem with blending in. Have a look at Bushcraft412’s video on his preferred hunting clothes by clicking play below! Basically, your deer hunting clothes should be comfortable and it weather-appropriate. Furthermore, they must be able to keep your body from the elements and in the right temperature. Lastly, they should always keep you safe from other hunters during the rifle season. If you have more tips to add to this list, let us know through the comments section! Do you want to read the original article? Keep reading this article over on our sister site. Now that you know how to gear up for deer hunting, why don’t you read more about the different deer hunting laws here? The one thing that’s contradictory is in tip # 3 is says to never wear cotton. I understand that, and I assume they are talking about blue jeans when they say: “Furthermore, deer can see the color blue as clear as the sky”. Then in tip #5 it says, referring to blaze orange, “Plus, deer aren’t very adept at seeing color so it won’t present a problem with blending in”. So which is it? Deer see blue better than orange???? Personally, I don’t wear blue jeans hunting and in Texas we aren’t required to wear blaze orange. Deer see blue very well and colors in that spectrum,they do not see the red spectrum well so they don’t see the orange.they also see white real well,i also think solid colors would not be a good idea! Very well known that blue stands out to a deer. Blaze Orange doesnt. Pretty simple. If you hunt hard you sweat regardless of the temperature and cotton takes a long time to dry. Pretty simple. Thousands of deer have been taken in simple red plaid clothing. It’s not that complicated. I’d worry more about their nose. Looking at the statistics here, blaze orange has had no change on hunting incidents. The ratio from no orange to orange is about the same although it has gone up some WITH the orange. And I think there will always be exceptions to what is worn, or smoking, or whatever. A deer’s nose seems to be the best radar, along with those big ears. Just for an example, a friend of mine smokes and was smoking when he harvested a nice buck about 20 yards downhill from him. Of course, he smokes whenever he hunts, but never takes in account the wind movement. Since I’ve known him for 20 years, that’s the only deer he’s ever killed. It’s just me, but I never wear cotton when hunting. I love wool, but I don’t wear it since I don’t have it anymore. 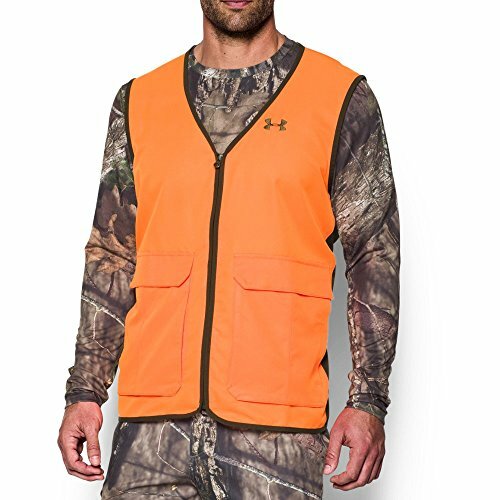 I am really interested in the clothing aspect of hunting. I did not know before that you should wear camouflaged polyester. If I go hunting soon, I will be sure to purchase polyester clothing to ensure an incredible trip. Thanks for pointing out that wearing waterproof clothes while hunting is a good idea since you’ll stay warm and dry. My husband recently started hunting, so I’ve been researching ways he can stay safe. I didn’t realize that the clothes you wear while hunting can have such a big effect!